Eve Dallas had a great vacation. Who wouldn’t when you get to spend it on a private island with your incredibly hot husband? But it doesn’t take long for her to get back into the swing of things when a dead body crops up on her watch. And this time it’s an accomplished and well loved musician who had nothing in his life that should bring him to such a gruesome and nasty death. This was a wrong place at the wrong time sort of murder. And for Eve Dallas, when it happens on her watch in her city? It’s very personal. Soon, a little digging uncovers the realization that it’s not a single person and this isn’t their only murder. Bodies begin to crop up across the country and soon Dallas is well outside her comfort zone when the case becomes not only inter-state, but southern redneck as well. Each Robb book promises a murder or a crime that’s guaranteed to cause outrage in the reader. 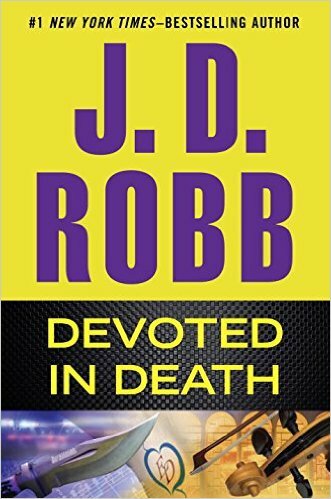 At the same time, knowing that Dallas, Roarke, and Peabody are on the case gives it a level of comfort. We know that these characters aren’t going to stop until justice is served. This time is no different. What is different this time around is the setting. Though Dallas is based out of New York, this crime spans several states including Oklahoma, Texas, and Arkansas. If you’ve ever read any of Robb’s previous In Death books (there are 40 of them!) you will be able to see how this creates an interesting new dynamic for Dallas. Also, there’s a new character – a small town law enforcement officer that just knows something about the cases in his lap isn’t right and he’s determined to see it through. I loved Banner and the addition of him to the team. In fact, it would be easy to see him in his own spinoff series. I think I’d enjoy that. A lot. He was easy to like and he fit in well with our team. It’s hard to come up with new ways to describe these books. Each one remains strong and the mystery solid. Dallas isn’t out of step and it doesn’t feel like these cases ever really have to end. You know what you’re getting in Robb’s adventures and this one surely delivers. Excitement. Energy. Crime. Twists. Mix them all up with a dash of humor and this time around, southern charm, and you’ll see why you need to pick up this book today. Robb does not disappoint and I, for one, am always delighted when I see an In Death book come in the mail. Once again, I can’t wait for the next adventure!